As the medical professions began to develop into a recognized science in the 18th century, the status of doctors and apothecaries was elevated. Evidence of their new standing in society can be seen in the prints and paintings in the Bristol-Myers Squibb European Apothecary collection. The collection contains portraits of important pharmacists, physicians, chemists, and botanists. Familiar names such as Samuel Hahnemann, ChristophWilhelm Hufeland, Paracelsus, and Carl von Linné are among those depicted. The collection boasts three copies of Cholera Prafervativmann” (Cholera Prevention Man, to the right), two in black and white, and one hand colored, which emphasizes the concern accompanying the cholera epidemics that swept through Europe during the 19th century. 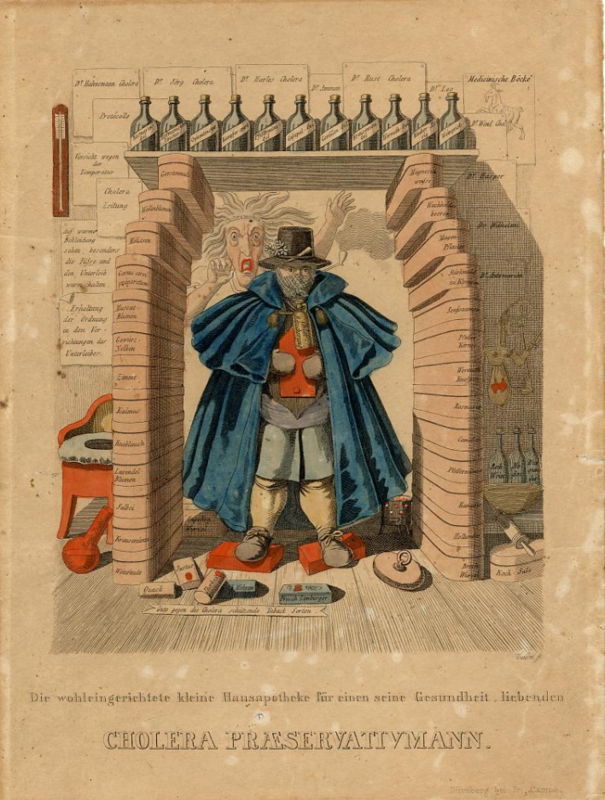 “Der Sündenfall des XIX Jarhrhunderts”, (the Fall of the XIX Century, see header) is a satirical commentary against vaccination and its acceptance by university doctors. “Officina Pharmaceutica Dietericiana” (Dieterich’s Pharmacy shop), 1991.0664.61, influenced George Griffenhagen’s decision to have a vaulted ceiling constructed for the new installation of the European Apothecary at the National Museum of History and Technology in 1966. The collection features several images of interiors of apothecary shops and laboratories, and satirical cartoons commenting on popular opinion regarding the medical profession. Many of the prints are German, with several from the Netherlands, Austria, France, and England. They range in size, type and level of detail, and they were rendered by a variety of artists. Some of the prints are elaborately decorated and, others have been hand colored, but most are black and white engravings. Three paintings in the collection, portraits of St. Jerome and, Christ the Apothecary, and an image titled “The Examination of Urine” depict popular subjects during the Renaissance. This print was created around 1690, and depicts a French drug store of the period. The physician is seated in a chair next to a table holding a beaker of urine. A woman stands behind him and two figures hover in the doorway. In the background are shelves of syrup jars and albarelli. There are two larger vessels on the floor. Urdang attributes the painting to the Dutch painter Jacob DeWitt (1695-1754). An apothecary in his shop stands behind a counter grinding herbs with a mortar and pestle while he converses with two gentlemen. The shelves in the background are stocked with boxes and jars for holding herbs and medicines. Portrait of Jacob Zobel, apothecary and owner of the "Moor Pharmacy" in Nuremberg. Etching of Johann Christian Preis who was an apothecary in Nuremberg.